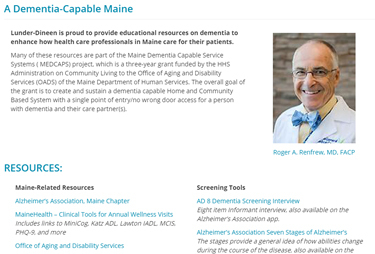 Lunder-Dineen supports the efforts of dedicated health care professionals in Maine who are working to develop increased capabilities statewide to care for patients with memory impairments in primary care settings. That’s why we recently launched an all-new area of our website that provides easy access to education and resources on dementia assessment and treatment. Dementia, though not a specific disease, is a wide range of symptoms associated with a decline in memory or other thinking skills that inhibits an individual’s ability to operate normally in daily activities, and has become a health epidemic in Maine and beyond. To learn more and browse the resources available, visit lunderdineen.org/dementia. Social workers are an important part of any health care team and serve a vital role across the continuum of care. We are proud many Lunder-Dineen team members and colleagues are social workers and are committed to delivering the best possible care and service to Maine residents. Pictured here is Lunder-Dineen Sr. 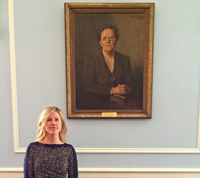 Program Manager and licensed social worker, Denise O'Connell, in the Trustees Room in the Massachusetts General Hospital historic Bulfinch Building in front of Ida M. Cannon's portrait—a social work and health care pioneer and leader. If you're a social worker interested in online courses, take a look at our course catalog. Any of the courses would apply to your field, and are free. We are pleased to announce the launch of seven new webinars on aspects of older adult health that are critical and relevant to health care professionals in Maine. These free sessions were recorded during the Ninth Annual University of Maine Geriatrics Colloquium and the University of New England’s 24th Annual Maine Geriatrics Conference. These free webinars provide valuable professional development on topics such as dementia, polypharmacy, medical-social issues, and other facets of aging and caring for older adults. To learn more and participate, click on any of the session topics below. Medical-Social Imperative: Do Health Care and Community Care Providers Need to Talk? This one-hour session was recorded during the Ninth Annual University of Maine Geriatrics Colloquium held on May 12, 2014, in Bangor, Maine. This presentation discusses insights from older adults as they navigate through their lives. According to poet May Sarton, old age is a foreign country and you must learn its language. Navigating the aging process provides challenges, transitions, crises and wonders. This session is intended for a wide range of medical, health, and behavioral health professionals who work in the fields of aging, health care, long-term care, and the social services. Also includes students enrolled in professional health and human services programs, educators, researchers and first responders. This one-hour session was recorded during the Ninth Annual University of Maine Geriatrics Colloquium held on May 12, 2014, in Bangor, Maine. Dr. Renfrew discusses the importance of falls as a geriatric syndrome and outlines an approach that clinicians should follow to prevent falls when providing care for a patient.